The name may be cutesy, but at Naansense, which opened in January, a group of experienced chefs are serving fun, delicious takes on Indian cuisine. 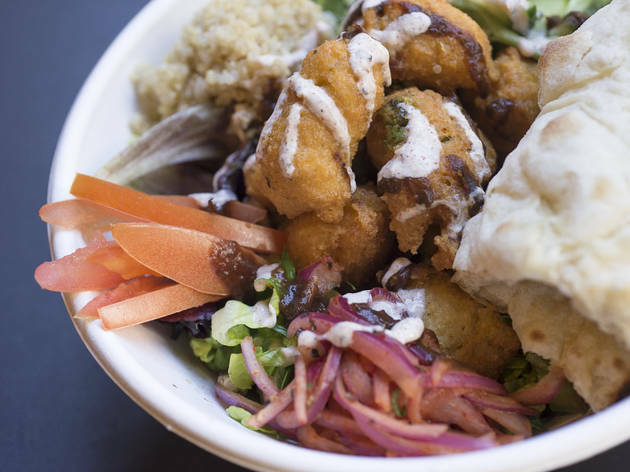 Led by chefs Hiran Patel (Veerasway, Lafayette) and Sahil Singh (Veerasway), the fast-casual lunch spot offers naan sandwiches, roti rolls and salads. Naansense only seats 24, and the music and the neon graffiti decorating the walls give it a modern Mumbai feel. On a recent visit, it was packed with a mix of Loop workers and college students. After a short wait in line, I reached the counter, where you can choose a suggested combination like the pork roti roll, which comes with pickled onions, cabbage slaw, garlic yogurt chutney and the extra spicy vindaloo sauce, or build your own salad, rice bowl or naanwich. Going with the salad, I had a choice between tandoori chicken, marinated pulled pork, lamb, lentil croquettes and paneer as proteins (I went with the lamb). You order Chipotle-style, so one employee added lamb, while another offered a choice of sauces. I made a good choice: The juicy, perfectly seasoned lamb was set atop crisp lettuce with cole slaw and sweet honey-cilantro dressing. The creamy tomato Makhani sauce provided an extra kick. The apple-tamarind chutney was an added bonus, and although there’s a lot going on, every flavor complemented one another. The vegetable samosas, however, which come two to an order, needed some extra spice. El stop: Blue, Green, Pink, Brown, Orange and Purple to Clark/Lake, Red to Lake. Bus: 22, 24, 37, 134, 135, 136, 156. 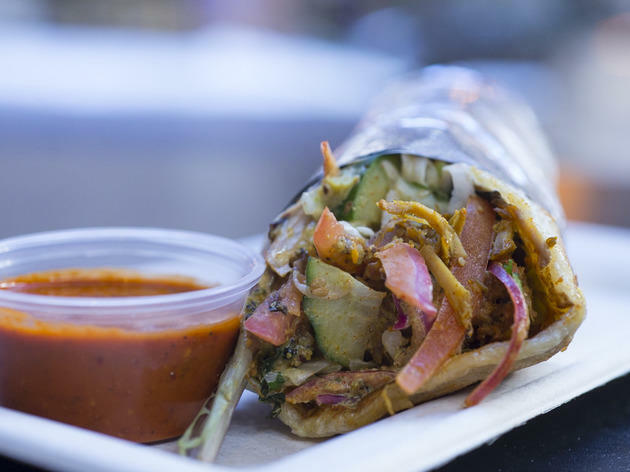 Naansense gives Indian food the Chipotle treatment, allowing you to construct bowls and naan wraps by choosing from a variety of proteins, sauces and toppings. You'll find tandoori chicken and braised lamb on the menu (as well as vegetarian-friendly options like roasted veggies and chickpeas) which you can douse with one of four spiced sauces—be careful of the vindaloo, it will set your tongue ablaze. It's nice to have fast options like Indian food besides sandwiches and burgers. 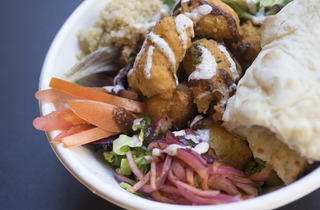 The options are endless in your bowl or on your naan but the price can get a bit steep. 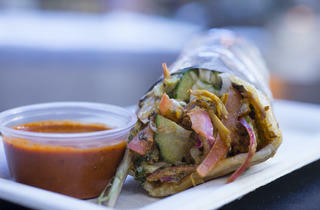 Even though it is expensive, it is a significant amount of food and you will want to come back to try all the options.